Creating a legal method to compel someone to temporarily surrender their guns if they're a danger to themselves or others is a common-sense way to prevent mass shootings and suicides, North Carolina Democratic legislators and gun-control advocates said Tuesday. The lawmakers urged Republicans to join them in supporting legislation to enable a District Court judge or magistrate to issue "extreme risk protection orders." Nine states already have approved similar laws, designed to remove firearms from the hands of people determined to be a great risk for causing violence, according to speakers at a Legislative Building news conference. Florida lawmakers quickly approved the idea after a troubled teenager with an AR-15 was charged with killing 17 people at a high school in February. A North Carolina House committee studying school safety following the Florida shooting didn't recommend the idea, however. GOP lawmakers leading the panel have been cool to this and other gun-related proposals, instead recommending more spending for campus police and student support staff and requiring more building safety measures. Democratic Rep. Marcia Morey of Durham, a chief sponsor of the protection-order legislation, praised the committee's work but said members "did not go to the heart of the problem, which is guns in the hands of dangerous people." Morey, supported by the Moms Demand Action group, said there were more than 1,400 gun deaths in North Carolina in 2016, nearly 800 of them gun-related suicides. "This is not a solution to gun violence, but it is a first step," Morey said, urging GOP leaders to allow debate and help approve the measure. Democratic Gov. Roy Cooper backs the concept of extreme-risk protection orders. So does the executive committee of the North Carolina Sheriffs Association, according to Eddie Caldwell, the association's executive vice president. He couldn't speak specifically about Morey's bill because he had yet to review it. But the gun-rights group Grass Roots North Carolina has expressed opposition to the idea, saying legal orders to take guns away from dangerous people typically deprive citizens of their constitutional right to due process. Morey likened it to a domestic violence protection order, which a relative, household member or law enforcement agency could seek from a judge or magistrate. The bill says the court official could quickly grant an order that lasts up to 10 days if it's determined there's "clear, cogent, and convincing evidence" that someone "poses an imminent danger of causing physical injury to self or others by having in his or her custody a firearm." The order would force such people to surrender any firearms in their care, possession, ownership or control; or permits to purchase them, to the local sheriff. At another full-blown hearing, they would be given the chance to speak before the judge to oppose an extended order for up to a year. Any such order could be renewed. Violating the order would be punishable by a high-grade misdemeanor. 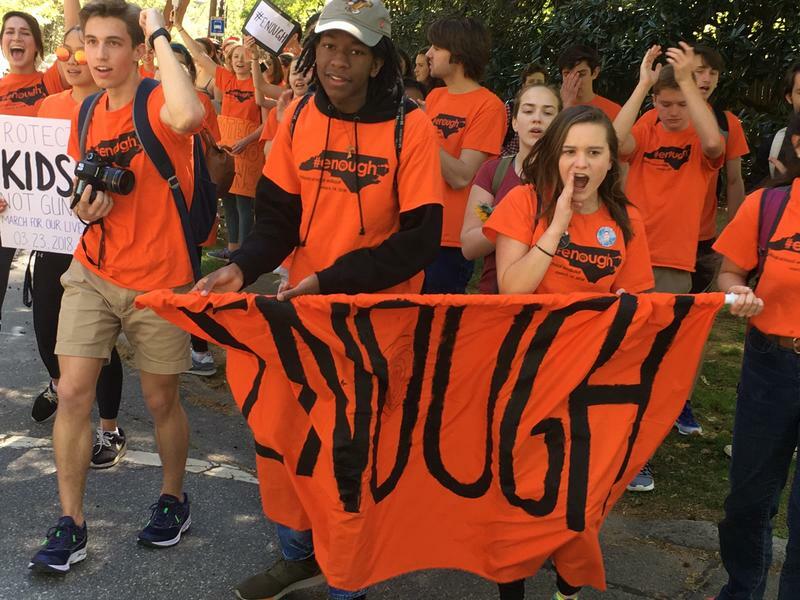 About 200 students from several Chapel Hill area schools marched together up a hill, and nearly five miles across their town behind an orange banner that said "Enough."